Beyond the adoption of the brand’s signature hourglass grille, which brings the CT200h in line with the rest of the Lexus range, there’s not much to pick the facelifted model from the 2011 original. Beneath the sheetmetal, though, Lexus has stiffened the chassis and worked to improve dynamics, while also reducing NVH. The combo of 73kW 1.8-litre Atkinson-cycle petrol engine and 60kW synchronous electric motor allied to a CVT transmission continues, as does the 100kW combined output. But a glance at the economy and acceleration figures – 4.1L/100km and 0-100km/h in 10.3sec – makes it obvious that the focus continues to be on thrift, not thrills, despite claims otherwise. Lexus claims 94 discrete changes were made in the pursuit of refinement – including a new engine inlet-duct silencer – that contribute to a quiet, well isolated cabin. Upgrades to the strut front suspension and multi-link rear extend to the springs, dampers, stabiliser bars and geometry, with the goal of greater compliance and increased dynamic ability. Roll stiffness is increased, and the gearing of the electro-mechanical power steering is revised. In the upgraded cabin, a new IS-derived steering wheel connects the driver to a chassis that sits flatter and corners with greater poise, while delivering a more substantial feel than before. The dynamics are more than capable of pleasing traditional CT buyers, but don’t quite live up to the sports billing, and won’t help Lexus on its quest to expand CT beyond its current age demographic (average age 48) into the 30-something market dominated by its coolly capable Deutsch rivals. 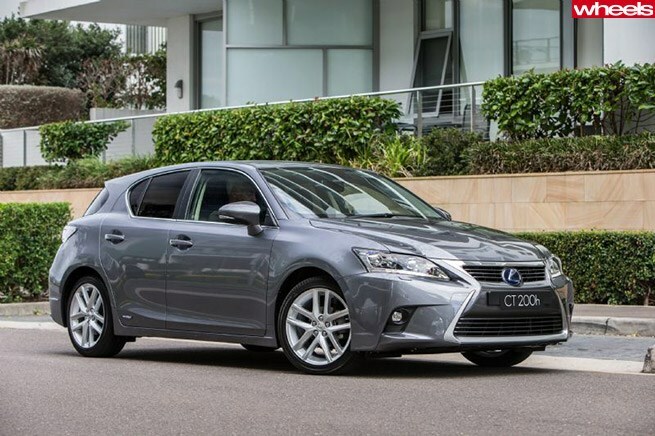 The CT200h is Lexus’s best-selling hybrid – the brand has sold more than 10,000 hybrids in Oz since 2006 – and the continuing success of the model is inextricably linked with the brand’s goal that 50 percent of its Aussie sales will be of hybrid vehicles. The CT’s handling capability is more than a match for the performance, but that says more about the driving reality of a CVT-equipped hybrid with just 71kW/tonne than it does about the chassis. The drivetrain lacks the power and responsiveness to adjust the chassis’ nose-led attitude on the throttle, and the droning soundtrack fails to inspire. Lexus CEO Sean Hanley admits that a petrol-only variant would provide a welcome broadening of the compact premium hatchback’s appeal. It could also give the CT200h the performance to justify its positioning. However, product planning man Stephen Wright says there’s no drivetrain diversity in the CT’s immediate future. The streamlined CT200h range kicks off with the Luxury, which at $39,990 fails to enter the $35,600 battle raging among its German rivals. The entry price stays the same, but the new variant is a better-equipped amalgamation of the outgoing Prestige and Luxury, bringing across-the-range features such as drive mode select with a second-gen remote touch controller, front knee airbags and keyless start. Prices rise to the $48,990 F Sport and on to the flagship $56,990 Sports Luxury, which wants for little in the way of kit, but is starting to feel expensive for a premium Prius.